Tamayuz strikes with force for first Group 1 win! G Force, a son of Derrinstown Stud stallion Tamayuz, made quite an impact at Haydock in early September by overpowering sprint specialist and hot favourite SOLE POWER in the Gr.1 Betfred Sprint Cup. He scored easily to win by three quarters of a length. Settled at the rear of the field, he slipped between his rivals with a furlong to go and swiftly got on terms with last year’s winner GORDON LORD BYRON before powering clear. He is the winner of two other races and twice Listed placed in the City Walls and Scurry Stakes. 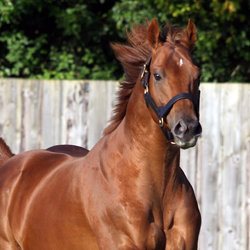 This was his first win at the highest level, and also a first Group 1 winner for his young sire Tamayuz. He is a half-brother to the Gr.3 Miesque Stakes winner Louvain, the Listed Fairway Stakes winner Laajooj and the Gr.3 Benbgough Stakes third Desert Poppy.